Austin, TX (October 16, 2015) - Construction crews mobilized this past Monday at Sterling City Independent School District to begin a new $6.3 million multi-sport athletic complex. The project is expected to be completed by February of 2016. After demolition of the site’s existing sports structures, Hellas will begin construction of a practice facility that will include a football field and running track. The field will feature Hellas’ exclusive Matrix® Turf, the same artificial turf used by the Dallas Cowboys at the AT&T Stadium, Baylor University’s McLane Stadium, and Allen ISD’s Eagle Stadium. 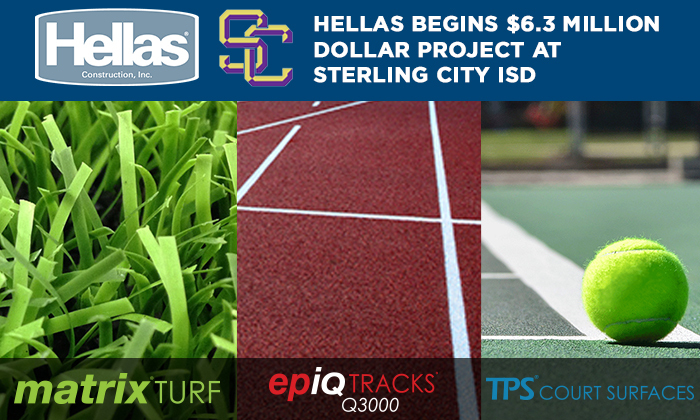 Hellas will also be installing an epiQ TRACKS® Q3000, a full-pour 10mm running track system that provides a fast and durable all-weather surface for athletes. Hellas will also construct eight post-tension concrete tennis courts with TPS® 5000 surfacing and a covered basketball court. The courts will feature player benches and chairs, along with shaded structures and spectator bleachers. The tennis complex will be completed with a locker room facility for athletes. Hellas will round out the project with a new mile-long fitness trail that features shaded structures and fitness stations. Additional facilities and amenities will be built throughout the site, including a concession stand and restroom building, a new pump house for the existing swimming pool, and renovated roadways and parking lots with decorative entryways. Hellas’ extensive lighting system will illuminate all areas of the project, including the playing fields, roads, walkways, trails, courts, and more.